“I want a six pack” is up there as one of the most common responses to the question “what is it you want to achieve at the gym?”. It’s something sought after by so many but something that seems so unattainable. Many people often fail to reach this elusive goal because of misunderstandings about the abdominals and how to train them. The first misunderstanding is to with what the abdominals themselves and “the core”. ‘The abs” are not one specific muscle, the abdominals are a muscle group. There are 4 distinct abdominal muscles which all have their individual functions and role: the rectus abdominis, transverse abdominis, ab external oblique and ab internal oblique. The muscle that everyone refers to as the “6-pack” is the rectus abdominis. So, the abs are not just one muscle and they are also not “the core”. The musculature of the abdominals are certainly part of the core however, the abdominals are not solely the core. The core is actually all musculature outwith the limbs and its function is to stabilise the entire body. The second misunderstanding is the belief that doing 100’s of crunches will get you a 6-pack when it’s actually all to do with body fat storage. You must drop your body fat right down in order to see the 6-pack. However, this is not to say that abdominals training doesn’t have its place; it’s important that we build size and strength in the abdominals (and core as a whole) as this will have a very positive impact on your posture, movement and stability. Get lower back in firm contact with the back support- Dig elbows and forearms into the pads. Step off and keep the core tight to support body weight and keep stable. Drive straight legs out aiming for a minimum of hip height or drive knees up towards the chest. Slowly lower the legs back down until the body is straight. Keep the upper body firm and fixed throughout the movement. As covered in the last Power Tower article, the PT Leg Raise is a staple of abdominal and core development. To really get the abdominal burning, raise your legs to parallel, hold, before you slowly down lower the legs back down to the starting position. 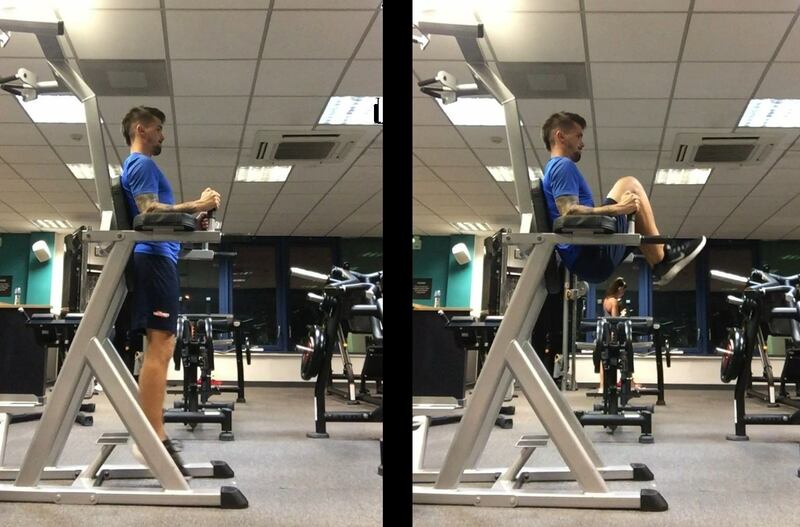 Set-up in the same way as the PT Leg / Knee Raises- Bring the knees up, as with the knee raises, but ensure to rotate the knees to one side. Extend the legs back out before bringing the knees up to the other side- Imagine you are trying to get the knees to touch the shoulders- Hanging will make the movement more challenging. Try a fix position (see Leg Raises picture) if this is too challenging. The Obliques function is to help with rotation of the body. Therefore, it’s important to focus on that “twist” and get the knees up towards the shoulder in a controlled fashion. Hook feet under bar or footrests of the Power Tower- Set up with knees up, backside in contact with the group, back lifted off the floor and cross arms over chest. Bring upper body upward (into the “N” position) and forward until the knees and chest are in line before lowering back to the starting position. Keep the lower body as stationary as possible- Make the exercise more challenging by extending arms above head and maintaining this position throughout. 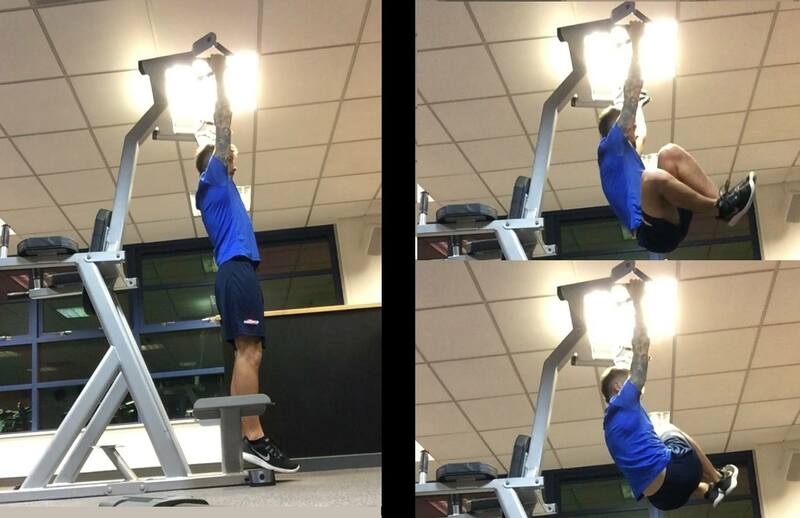 We want to maintain the tension through the abs throughout this exercise which means avoiding bringing the chest right up to the knees and avoiding touching the floor with each rep.
Start in a hanging position. 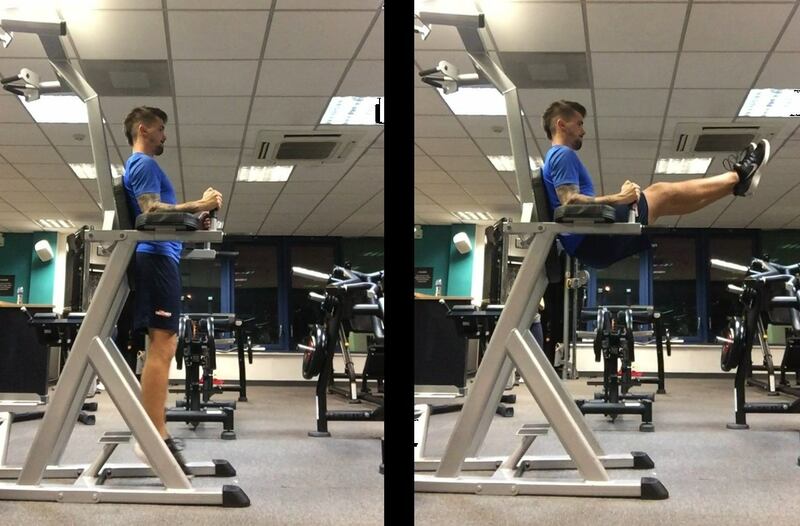 Very similar movement to the knee raises but with an added hinge of the hips this time which will bring the body towards parallel with the floor. Bring upper body upward and forward until the knees and chest are in line before lowering back to the starting position. Extend the body back out back to the starting position whilst maintain controlling. Definitely the most advanced exercise and challenging one of the lot - you’ll really feel a stretch in the Lats (back) as it works to hold and stabilise you at the top of the rep. 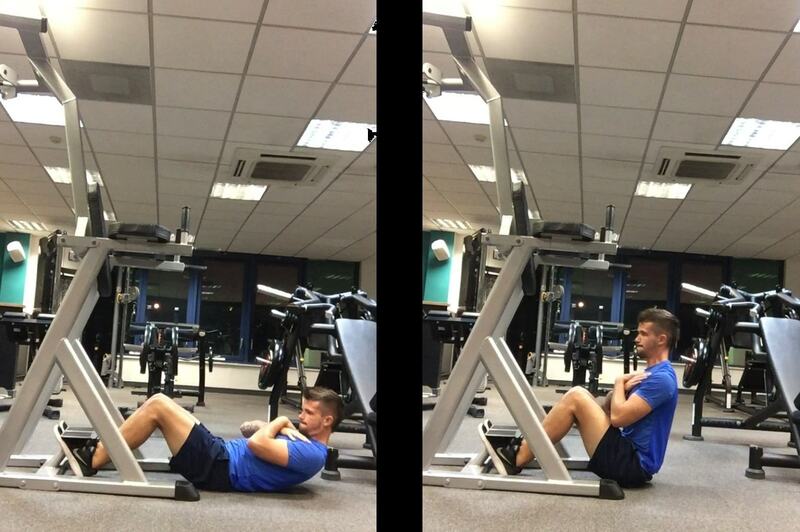 Some simple yet very challenging Power Tower abdominal exercises. 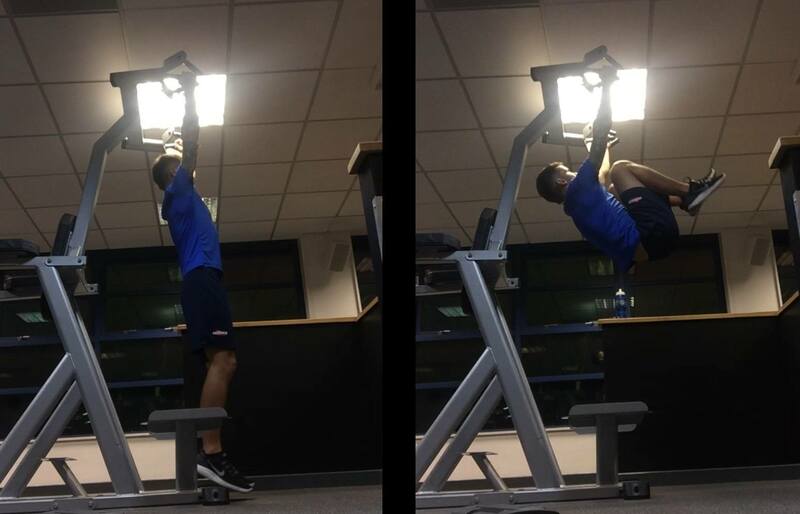 Incorporate them into your sessions, whether it be gym or home based sessions, to really get the abs on firing! Go on… give them a go. Chris is a qualified Personal Trainer with 7 years experience. He's a health and fitness writer based in Edinburgh, Scotland. Interests and specialties include the human body, coaching, bio-mechanics, and sports performance. Currently writing a book based on improving football performance. Previous Post Power Tower Workout Routine Next Post How Long Does It Take To Tone Flabby Arms?